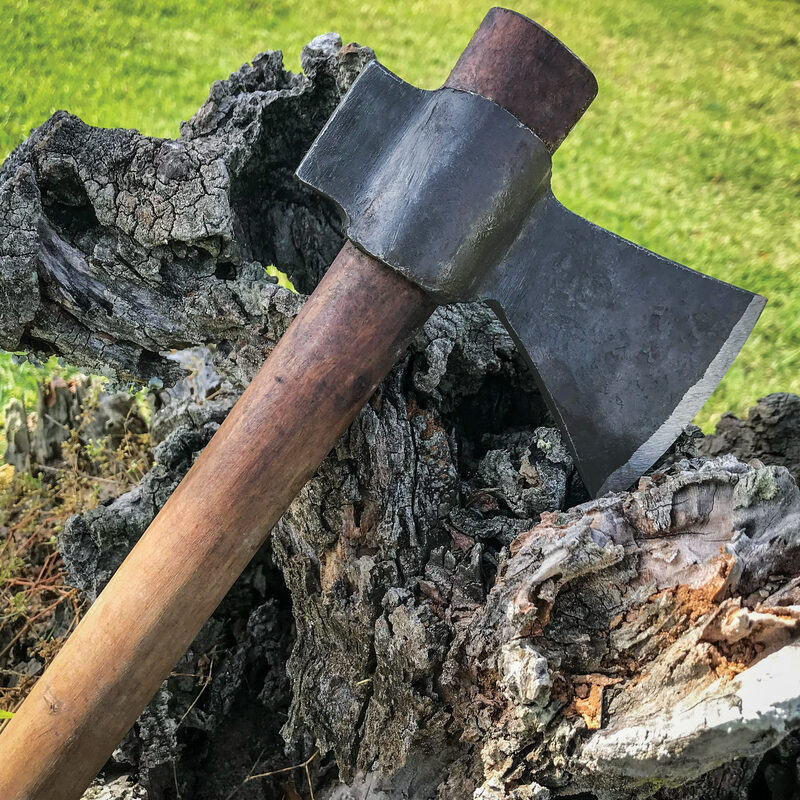 Top-quality hand-forged tomahawk axe delivers a fierce single-blade design done in rock-solid cast iron. The real sheesham wood handle is smooth and attractive, giving this excellent piece a rugged yet refined look and feel. 6-1/2" axe head; 18-1/4" overall. The head was loose, very dirty and oily, and the handle moldy. Aside from that .... 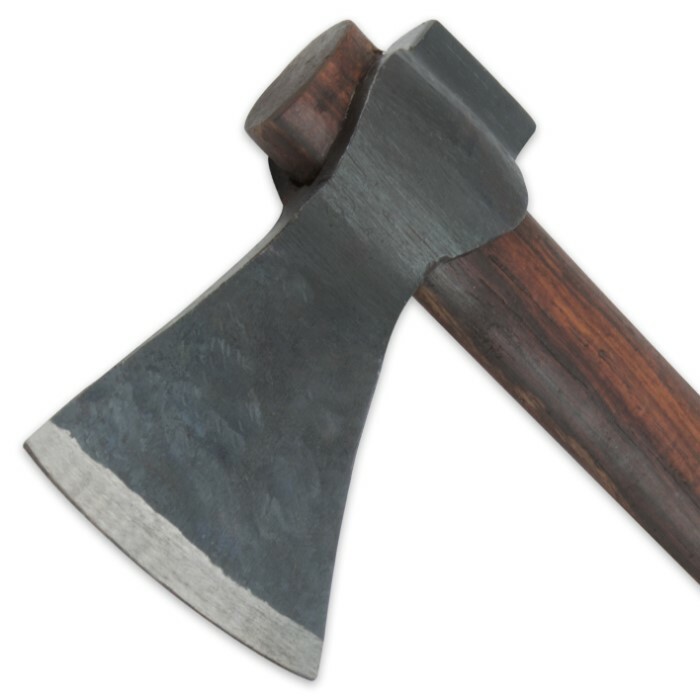 The head is forged and the opposite side can be used for hammering. I can clean the handle and secure the head. I don't throw my axes, so for the price, I'm happy enough with it. A must have. Buy it on BOGO. The head was a little loose when it arrived, and it was also about as blunt as my skull. But honestly, that's all I have to complain about, and it's nothing that can't be fixed with a little ingenuity. Just wedge some splinters in next to the haft through the eye, and then mill the blade down to an edge. I'd have preferred it to be fully functional upon arrival, but for a sum total of about $25, you can't really get much better. It's not that hard to make it functional, and it's absolutely beautiful. NOTHING MUCH COMES REALLY SHARP THESE DAYS, but these were kind of ridiculously dull. the "cutting edge" side on all of them had about a 1/8" flat spot. If you are into filing you will like these, there will be lots of filing to do to get them good. If you want to put just a "wedge" cut edge on it , that will take a little less time. I personally ,like a tapered edge, after an hour (carefully so as to not lose much temper) I got them to a point where they are ready for a file, that should take another hour or so. The steel itself is made in India, I have some hatchet with India steel, they are actually quite good, take a very sharp edge, and holds well. I cannot disparage Indian steel. I haven't gotten to that point with these yet, but they must be high carbon, judging but the carbon I got on my hands handling them, they look as they are painted, but they are not, it is all carbon deposit from hand forging, forging is good , but they could have been cleaned up some. I gave mine a rough cleaning and coated with linseed oil, Was it a good deal, not sure, If you count 2 hours of labor to get them "right" makes the "real" cost $30 or more. If you are not into or not good at extensive axe sharpening, do not get these, Get something more finished like CRKT. iF YOU GET THESE IT WILL TAKE A LOT OF WORK TO MAKE THEM USABLE.. 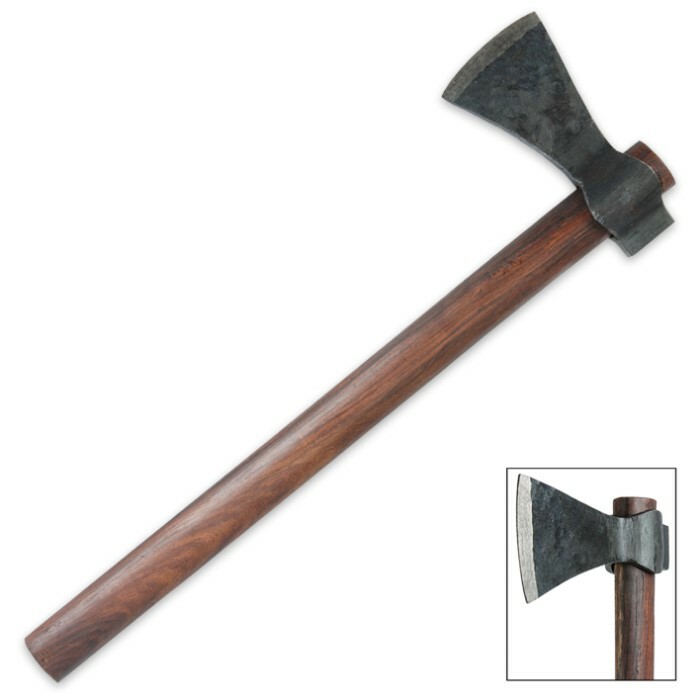 I know from whence I speak, I have over 40 axe, sharpened them all (even the Ochenkoph), and restored many of them. ya, ya, ya, ya, YEET!!! !